Titanosaur dinosaurs were found in two Upper Cretaceous units of La Rioja, Argentina. in Hechenleitner, Fiorelli, Martinelli & Grellet-Tinner, 2018. • Titanosaur dinosaurs were found in two Upper Cretaceous units of La Rioja, Argentina. • Most of the specimens are interpreted as non-Saltasaurinae lithostrotians. • Few bones (caudal vertebrae) show features consistent with pathology. • Differences in caudal vertebrae suggest the presence of at least two taxa. 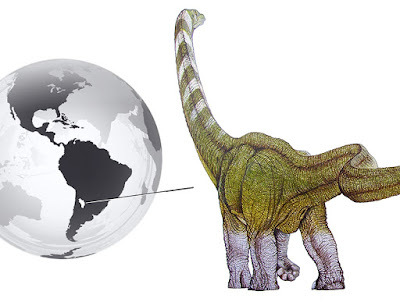 Our current knowledge of Argentinean titanosaurs outside Patagonia has been effectively limited to the province of Salta (e.g., Saltasaurus). However, several skeletal remains of titanosaurian sauropod dinosaurs have been discovered in the Cretaceous strata of La Rioja Province, northwest Argentina. 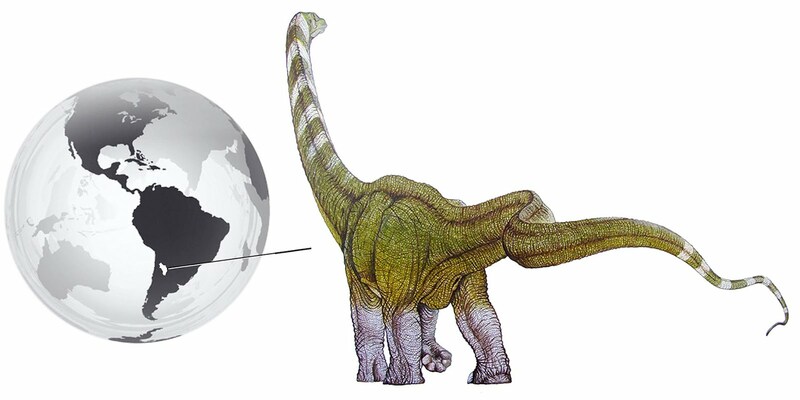 Herein we describe new titanosaur material from two Upper Cretaceous localities from La Rioja. The first record corresponds to two caudal vertebrae found in the exposures of the Ciénaga del Río Huaco Formation, in the Quebrada de Santo Domingo locality. The largest sample, which includes fragmentary postcranial material of five individuals, was recovered from the Los Llanos Formation, in the Tama locality. The comparative analyses conducted here suggest that most of the specimens should be referred to as Lithostrotia non Saltasaurinae. However, differences between the middle caudal vertebrae from Tama and Quebrada de Santo Domingo suggest that the taxa at each locality are distinct. Material. CRILAR-Pv 518a-i, nine partial caudal vertebrae. 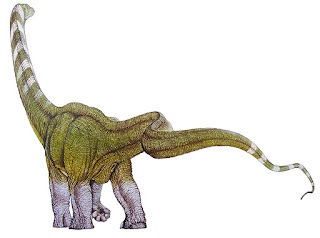 The sauropod specimens described from La Rioja province herein are all referred to Titanosauria. CRILAR-Pv 518 (nine caudal vertebrae) can be identified as a non-saltasaurine lithostrotian, as it presents strongly procoelous centra in its anterior and middle caudal vertebrae, a synapomorphy of Lithostrotia (Upchurch et al., 2004). In addition the centra are almost as high as wide, instead of dorsoventrally compressed as is typical in Saltasaurinae. The information provided by the few appendicular elements of the specimen CRILAR-Pv 509 suggests that it could be also considered as a non-saltasaurine lithostrotian, as it shows remarkable similarities to Aeolosaurus, Uberabatitan and Bonitasaura, such as the pubis being elongate and only slightly recurved, differing from Saltasaurinae, and the condylar surfaces of the distal end of the femur are perpendicular to its major axis rather than “beveled”. The specimens CRILAR-Pv 510 and 511 are fragmentary and not particularly diagnostic. However, the procoely of the small centrum of the caudal vertebra CRILAR-Pv 510, as well as its proportions, suggest titanosaur affinities. Considering the taxa represented in the Los Llanos Formation, the ilium CRILAR-Pv 511 has a relative size and a series of characters (such as the lateral expansion preacetabular crest, and the extensive and continuous union between the pubic peduncle and the preacetabular crest), which could only be consistent with the morphology of the Titanosauria. The poor preservation of the specimen CRILAR-Pv 525 obscures a clear diagnosis but the evidence suggests that its anomalous structures have a pathological origin. Both the presence of bony overgrowth and draining channels (subperiosteal pits) suggest that the origin of this condition was a response to an infection. 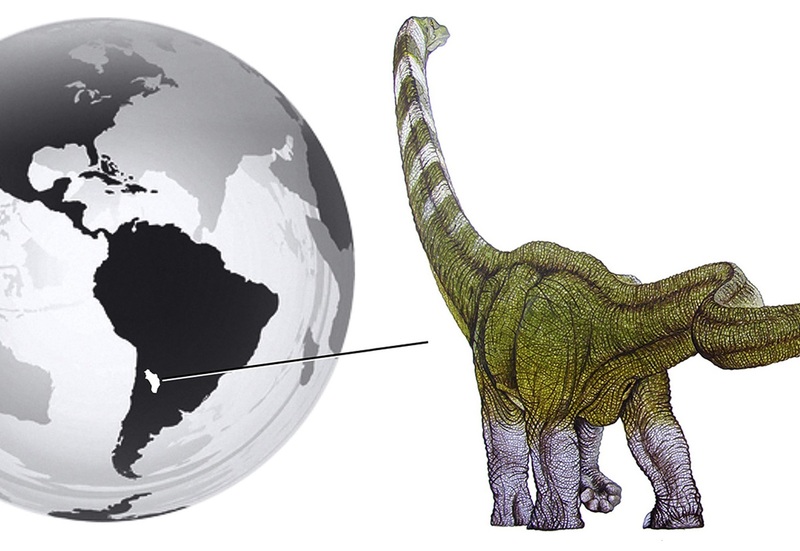 This constitutes an additional paleopathological record for titanosaurs, which were unreported until recently.